Want to be able to drive around and keep your customers aware of who you are? 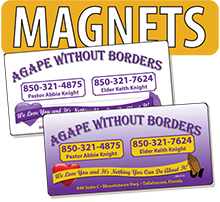 Vehicle Magnets are just the thing! 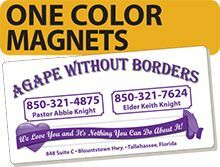 We have One and Full Color Magnets to fit your price and your needs. Both of them come in a tough Magnetic Stock that will last through the rough weather. We can even design something that you will be proud to stick to your vehicle for a long time to come! Custom sizes and shapes are also available! Let us know by Contacting Us! Want to make sure your business card hangs around? 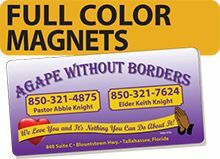 Magnetic Cards come in Full Color and will make sure your card sticks in their minds and refrigerator! 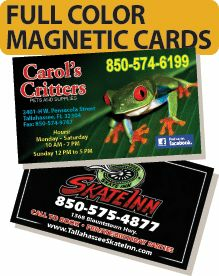 Check out these and all the other options available to make the most out of your business card order!